Kyocera Mita KM-1820 is a multifunction printer with monochrome capabilities for printing and copying while providing high quality scanning for offices and businesses that have varied office needs. For faxing needs, the Kyocera Mita KM-1820 provides an optional fax system that is as fast and effective when matched with industry standards. With Kyocera’s affordable, efficient consumables coupled with reliable performance, the Kyocera Mita KM-1820 should prove to be a great choice for users, whether at home or in a busy workplace. The Kyocera Mita KM-1820 comes in with a standard 250-sheet drawer and a 50-sheet multipurpose tray for special media types, and a maximum 550-sheet capacity. For its copier function, standards memory is set at 96MB, upgradable to a 320MB that should be adequate enough to handle complex and moderate to high volume copy production. 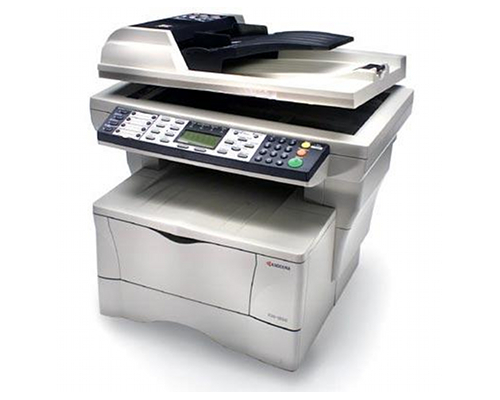 The Kyocera Mita KM-1820 also features an optional 50 sheet standard document processor, which is an automatic document feeder. Resolution for the Kyocera Mita KM-1820 are 600 x 600 dots per inch at 256 halftone levels, fast 1200 mode that translates to 1800 x 600 dpi and a 2400 x 600 dpi for highly crisp and detailed copy outputs. Magnification features options such as full size magnification, auto magnification and a 50-200% zoom option with increments as detailed as 1%. This should ease any burden regarding capturing specific size outputs without sacrificing quality for the Kyocera Mita KM-1820. Other copy functions include continuous copy for up to 999, auto, manual, text and photo modes plus Scan Once Print Many, Electronic Sort, ECO mode for efficiency in power consumption, 8 Job programs and Job Reserve for customization options, Department Management and Copy Priority Function. Printing with the Kyocera Mita KM-1820 takes about 18 pages per minute for letter and 15 ppm for legal, which is identical to its copier speed. Print controller is handled by a PowerPC750 processor with a 300 MHz capacity, and shares its memory with the machines copier handle. As a multifunction device, the Kyocera Mita KM-1820 has utilities available for its functions, such as PDF direct print, KM-Net Viewer, Kyocera Command Center and PRESCRIBE utilities, a given utility feature among Kyocera printers. A handy addition here is Kyocera Mita KM-1820’s quick set up tool, which should make it a lot easier to handle and configure, without any assistance from an experienced printer operator. Email printing and API support are also included. The scan function boasts multiple resolutions at 200, 300, 400 and 600 dpi, with speeds registering at 18 pages per minute for black and white scans and 5 ppm for for color output. File formats are PDF and TIFF for mono scan files and PDF and JPEG for color scans. Scanning features on the other hand include Scan to Folder via SMB, scan to FTP and scan to email and TWAIN. Drivers for various platform distributions among operating systems such as Windows, MAC, Novell and Linux are provided. Other additional options for scan are LDAP, 8 one Touch Destinations and Scan Color Select. The optional fax function is available with a modem speed of 33.6 Kbps with Auto fallback, capable of transmission speeds as fast as 3 seconds per page. Fax memory is set at 6MB, which also features a quick scan option with a speed of 2.5 seconds per page. One of the downsides in the Kyocera Mita KM-1820 is the lack of automatic duplex function, so duplex users would need to manually feed the media to make use of the manual duplex function. 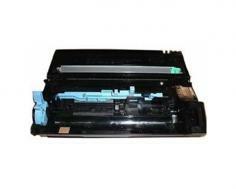 More importantly is the machine’s performance for its speeds, especially for print and copy functions. Other multifunction devices and machines already have made significant improvements and changes to the machines performance, and the Kyocera Mita KM-1820 has maintained relatively lower speeds compared to others in the market. 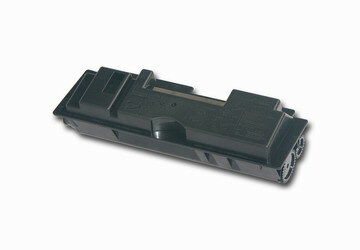 Review it: "Kyocera Mita KM-1820 "
The Kyocera Mita KM-1820’s toner cartridges come in with a yield of 7,200 pages on 5% coverage. While original toner cartridge for the Kyocera Mita KM-1820 is affordable enough, compatible cartridges can go as low as $20 for the same yield quantity. Monthly usage cycle is 15,000 pages as a maximum, with a recommended 3,000 pages per month.